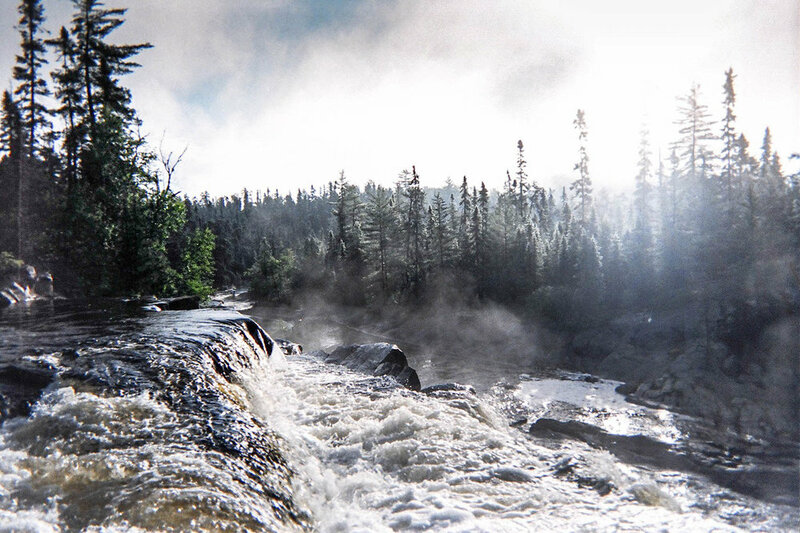 The four-armed Lady Evelyn River stretches through the highlands of Temagami, tumbling over rapids and waterfalls as it descends to lowland lakes. It begins with two branches, which eventually merge and then diverge again - each branch offering a variety of enchanting waterfalls. Our van shuttle drops you off at Gamble Lake, which will position you on the north branch of the river, from which you can reach the heart of the the river more quickly. The central section of the Lady Evelyn River features minor rapids, waterfalls, and two larger lakes – Macpherson and Katherine (aka Divide Lake). It also features Shangri-La, a long stretch of rapid that can be by-passed entirely by a 730 m portage – the longest found on the river. Experienced paddlers can paddle some or all of this section utilizing two shorter portages as needed. Those portaging can access the riverside via side trails, one of which leads to a lovely Shangri-La campsite. Immediately following Shangri-La, paddlers have the option to portage and paddle into Dry Lake. On the western shore, the Dry Lake Ridge Trail climbs more than 200 meters for an impressive view of the surrounding area. As you leave Katherine Lake, the Lady Evelyn River splits again into north and south branches. Both offer beautiful waterfall scenery and challenging portages. The north branch is shorter in distance and features Centre Falls and a natural water slide (channel your inner otter, but don’t forget your lifejacket!). This branch leads you east, then north toward Chris Willis and Sucker Gut Lakes, should you want to journey on to Maple Mountain. The south branch flows mostly south, then east into Willow Island Lake. It’s longer in distance and features Bridal Veil Falls and Fat Man’s Falls, named for a section of portage through a crevice known as Fat Man’s Squeeze. The south branch also provides access to the infamous 2.2 km Death March portage to Diamond Lake, should you be so inclined! Rest assured, any combination of north and south branches provides a remarkable backcountry canoeing experience. Either branch of the Lady Evelyn River leaves you needing to paddle out to an access point - Ferguson Bay or Mowat Landing - for a shuttle pick-up. This final leg of the journey will take 1 to 2 days to paddle regardless of the pick-up point chosen. We look forward to hearing all about your trip!